NBC10 Boston's Kevin Walsh wraps up the Dell Technologies Championship, and he says while no one is playing better golf than Bryson DeChambeau, it's still Tiger's world and we're just living in it. Two legs into the FedEx Cup playoffs, there’s still only one winner. Bryson DeChambeau has gone back-to-back, following up last week’s win at The Northern Trust with a title at the Dell Technologies Championship at TPC Boston in Norton. DeChambeau, who began the day one stroke back of Abraham Ancer at 12-under for the tournament, shot a 4-under 67 on Sunday to wrap up at 16-under. He beat out Justin Smith for the top spot, who shot a 3-under 68 on Sunday to finish 14-under for the weekend. 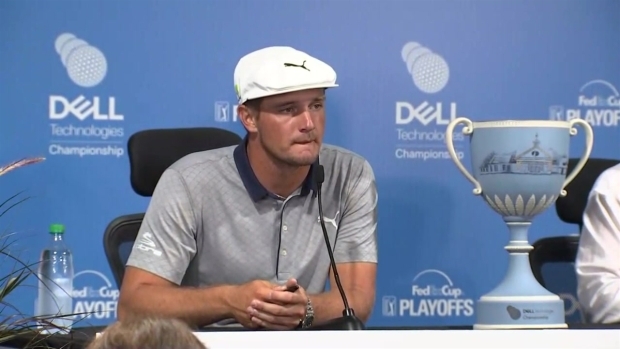 Bryson DeChambeau spoke following his win in the Dell Technologies Championship, when he said he's been playing great golf all year and it was just a matter of time before something pretty cool showed up. DeChambeau said he was fortunate enough to hit shots in the right place, miss in the right place and make a few clutch putts. The win was the fourth of DeChambeau's career on the PGA tour and his third this season. The "mad scientist," who spoke often of his reliance on biomechanics in his game, became the first player to win the first two legs of the FedEx Cup Playoffs since Vijay Singh in 2008. With the completion of the tournament, the return of Tiger Woods to Massachusetts has come and gone, with no return date set given the uncertainty surrounding the future of the Dell Technologies Championship. Playing at TPC Boston for the first time since 2013, Woods leaves with a 24th-place finish in the event he won back in 2006, finishing 7-under par for the tournament. Woods did not speak with the media after his round today, a first for him this weekend and apparently, a first all season long. Per media members who have followed Woods around during the 2018 PGA season, Monday marked the 60th round Woods has played this season. He’s now 59-for-60 in speaking with the press this in ’18. Woods began Monday with the same score, tied for 16th and six strokes off the lead. After recording birdies on two of his first four holes, however, Woods ran into some trouble. He incredibly managed to save par on the seventh hole after flying his tee shot into the woods, chipping back to safety and two-putting for a 5 on the hole. He even managed to birdie the 11th before a bogey on 14. The 16th, a 187-yard par 3, proved to be the last stand for Woods. His iron shot off the tee landed on a downward slope well shy of the green before plummeting into the water, necessitating a drop. He wound up with a double-bogey on the hole – his lone double for the tournament – before finishing the day at even-par 71. A 6-foot putt for birdie on the 18th lipped out for Woods. Phil Mickelson posted far and away his strongest round of the tournament, notching an 8-under 63. Lefty was 4-under on Sunday after posting back-to-back 1-over 72s on Friday and Saturday to finish at 10-under for the tournament. “It feels really good to put it all together,” Mickelson said. Like Woods and DeChambeau, he has a very compelling case to be made that he deserves to be one of Jim Furyk’s captain’s picks for the US Ryder Cup team. Furyk has said he’ll make three of his four wild-card picks on Tuesday after the completion of the Dell Technologies Championship. Justin Thomas, who won this tournament last season, finished tied with Woods at 7-under. Thomas is one of eight automatic qualifiers for the US Ryder Cup team, along with Brooks Koepka – who played with Woods on Sunday and shot a 3-under 68, finishing the tournament at 10-under – as well as Dustin Johnson, Patrick Reed, Bubba Watson, Jordan Spieth, Rickie Fowler and Webb Simpson. Simpson held sole possession of the lead in Norton through two rounds before struggling to a 5-over 76 on Sunday and a 3-over 74 on Monday. He finished at 3-under overall, tied for 49th. Ancer, the leader to begin Monday, shot a 1-over 73 and finished tied for seventh at 11-under for the tournament. Rory McIlroy, who along with Vijay Singh is one of two players to win twice at TPC Boston, finished tied for 12th at 10-under.